It has always been a perplexing question, “Do fairies exist?” As an intuitive I have been to certain forest or places of nature and felt the difference sensation, a lighter feeling inside of me. It is always a in the forest having a more pure nature feeling. It always feels the same to me, taking me back to a visceral sensation of the child inside of me having fun generally found in my solar plexus area. It is the calm spirit in nature having a more playful side. It is the fairie consciousness. I double checked by using muscle testing or Applied Kinesiology techniques and ask, “Is this the consciousness or energies of fairies?” If I get a yes read I trust I am in the middle of a group of fairies. I have never seen a fairy before but would like to do so. However my psychic abilities are more of a visceral, energetic sensation instead of a visual one. A friend of mine explained of fairies were a elemental component of a forest. They were simply an energy, maybe a higher vibration of nature. Some people were able to see the elemental spirits in the form of a small, humanlike beings. In fact, it is of an expression or vibration of the trees, plants, rock and earth itself. In nature there is a reality of no separation between the life forms, on a quantum physics level we know this is true however in nature the plants live in that expression. Their vibrations are in communication with all in the forest or nature, they appear confined by being the bark, limbs, leaves and unmovable but is far from the truth. A tree moves to commune with other trees and plants through out the forest in a quantum way. It extends its consciousness by having no separations from other objects, in other words a tree has no separation from the earth, air and other plants. They all live in a collective consciousness so what occurs to a plant a mile away the tree perceives it. The fairies are a part of this expression of nature’s group consciousness. Each forest has its own qualities and fairy energies arise in certain places. A tree consciously expresses itself beyond its treelike body not only with others aspects of nature but also in other realities or dimensions. People who are extra sensitive may feel these other dimensional qualities along with the fairies yet not know why. They simply feel something lighter, happier or more peaceful inside of them. Fairies appear to be something indicative of a higher vibration occurring in some natural areas. The Nebias forest is special because it has nature energies moving through it from other dimensions and from the earth itself influencing the forest in a unique way. 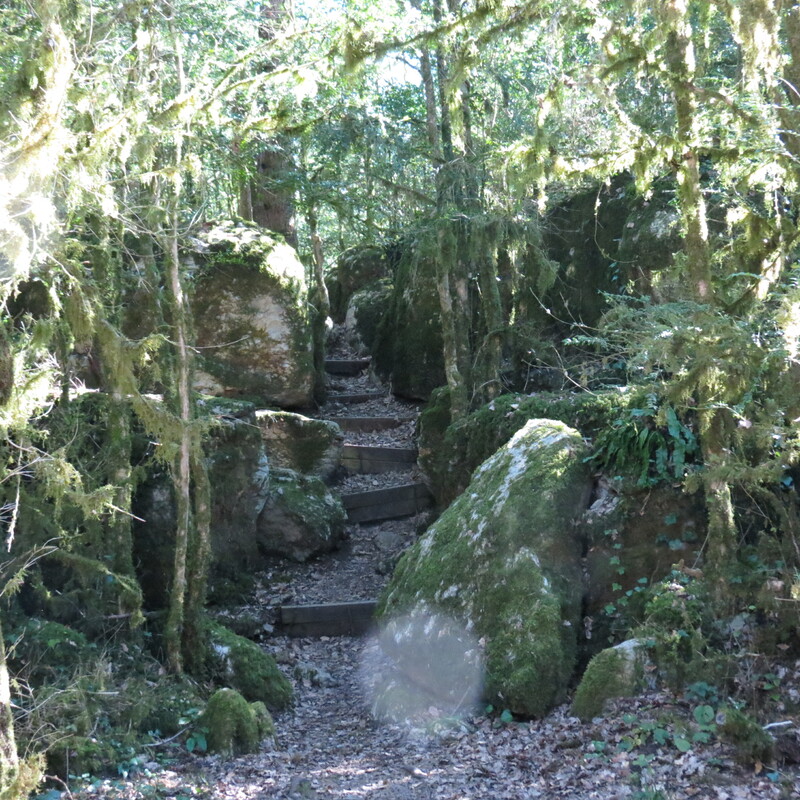 In a forest such as Nebias, located in the lower levels of The Pyrenees Mountains of Southern France there exists a wide variety of energetic openings from other dimensions within the earth and it energizes the lands in a special way. The trees and rocks sing in a harmony that resonates the consciousness of fairies. Some say they hear their laughter or see a glimpse of something in the corner of their eye. I feel a great joy feeling as if invisible, angelic like children are playing all around me. Still, no one I know has had a direct visual, fairy experience. On my last visit a friend and I went and spent time at “The Harp”. Made popular from a tree with a unique shape of four large limbs growing out in a harp design, located in an area I call “Fairies Central” due to the light heartening feeling I get when I enter into the small valley. We sat and meditated at this highly energetic spot wishing to tune into the fairy world. After a while my friend said, “Feel this?” I felt an intense buzzing feel inside my third eye closer to the pineal gland. “Wow! What was that?” ran through my thoughts. My friend had sensed a presence of a fairy near her. She placed her attention on the place she perceived the energy and began a telepathic conversation. After a few minutes of getting to know each other she invited the fairy to climb into her hands. There they communed together with my friend as she received an enchanting experience. Finally she lifted the fairy up to my forehead where I felt the etherical energy in my third eye area. What gratitude. Sometimes if we wish to have validation, it will come to us in surprising perspectives. The universe works in ways the mind does not. I am grateful to having another profound encounter with a fairy. I know my friend could not have generated this different, strong sensation in my forehead. Even if I do not understand their make-up, what they are created from, or even what they look like. I choose to believe in fairies and their existence at Nebius, Southern France.